Four Faced Rudraksha or Char Mukhi Rudraksha has four natural lining on its face. This bead is generally found in oval or round shape. The deity of Four Faced Rudraksha is Brahma. This bead also symbolizes the four essentials of life in Hindu Philosophy namely, Dharma, Artha, Kama and Moksha. Mercury, in Astrology, denotes the learning, intellect, brain and vocal power in the chart of a person. Benefic Mercury gives immense brain power and logical mind while on the other hand negative Mercury deprives a person from all these qualities and creates dullness and lack of interest in studies. The ruling planet of Char Mukhi Rudraksha or Four Faced Rudraksha is Mercury. If Mercury is weak by virtue of placement in the horoscope, this bead helps in removing all the negative effects of the same. 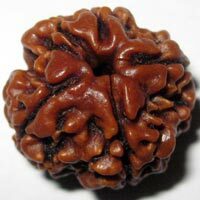 All those who are involved in mental work like professors, scientists, writers and researchers should wear Char Mukhi Rudraksha to enhance their wit and intelligence. This bead protects a person against various mental illnesses like dullness, lack of memory, OCD, paralysis, asthma and respiratory problems etc. This bead should be worn around neck in red thread or in silver chain. To get the maximum benefits from this bead, the above mantra should be chanted 108 times (One rosary) daily. The auspicious day for wearing this Rudraksha is Wednesday. Is June 2015 Auspicious For Your Marriage? When I Will Get Married ? How To Choose Career Through Astrology ? Which Career Your Horoscope Indicates ? How To Match Horoscope Before Marriage? How To Match A Horoscope Before Marriage? How To Choose Career Through Astrology?